layer definition = unique labeling of each layer leads us how to make your board . layer orientation = labeling to avoid mirrored layers. 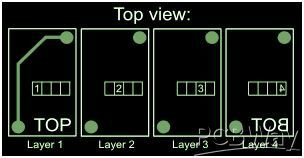 To produce your PCB correctly, it must have a label(name) for each layer. Even when your data uniquely defines which layer the top or bottom is, the layer orientation for Design Rule should be followed. Many Layout programs permit mirrored data output, so confusion may cause. View from top side of the design file, we need all top and inner layers in normal vision as the real board, but for all bottom layers, mirrored vision is requested. Below picture is an example. The captions "layer 1" to "layer 4" are shown only for clarity. Please go to homepage of PCB Instant Quote menu to quote; please contact us for more information about pcbs.